MAHATMA GANDHI INTERNATIONAL SCHOOL: Gujarat, India. The Mahatma Gandhi International School sits in a leafy part of the city of Ahmedabad. Across the street one of seven villages that remain within the city creates a stark contrast to the substantial houses and affluent elite of Ahmedabad. The school reflects the diversity of the city. People come with various life experiences and backgrounds, including some children from Europe and Korea. The teaching staff also reflects some diversity. The school has students from Prep to Year 12. One of the school’s ambitions is to cut across the religious and class structure that impacts every aspect of Indian life. As a result of this philosophy, students from high class and overseas backgrounds are being educated alongside children whose parents are of lower class. Class-consciousness is ever present throughout India. Alex ran a drama workshop at this school six years ago and was invited to run workshops again during this trip to India. 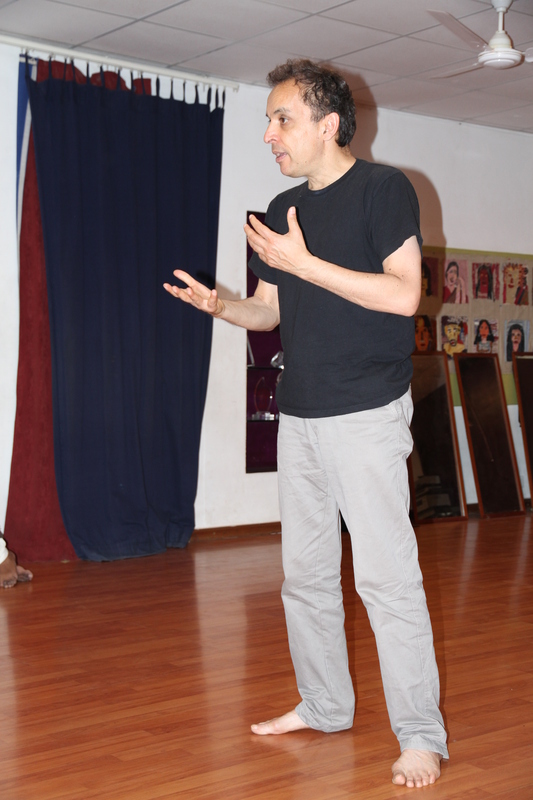 “Anjou Musafir, one of the school founders and its theatre teacher, has a strong interest in physical theatre and was always keen for me to return, so it has been good to have the opportunity to do that”. One of the delightful aspects of the school’s practice is their openness to bringing experts to teach skills in areas. “This time I was invited to work with senior students who are studying for their International Baccalaureate in theatre. One aspect of their theatre studies was the work theatre teacher Jacques Lecoq, who was my teacher. Working in the Lecoq style, we looked at the physical approach to performance, including mime, movement, clowning and Commedia dell’Arte. Commedia Dell’Arte is an excellent training for young actors and it demands that they lose their inhibitions and perform with authority and passion Clowning allows students to open up so they can express their individuality, become vulnerable, and be playful and funny. This physical approach to theatre is always challenging for teenage students; it confronts their inhibitions at a time of their lives when there are so many changes. Added to that, in India personal displays of affection, showing emotions in public, loudly displaying individuality are not encouraged, and deep shyness – particularly among women – still prevails. We started each day with games to help develop confidence imagination and creative courage, and which are also crucial in developing a strong sense of a group, an integral aspect to making theatre. We committed to creating a performance for the whole school for the last day of our stay – another challenge for the students! In order to achieve this goal, students had to fully commit to the process, forge a commitment to the group and work creatively with each other. Time management, class attendance and focus in the rehearsal room were all issues for these teenagers to consider. That theatre is about committing to something outside yourself was an important lesson learnt. The school has no art teacher although they integrate art into the curriculum through a whole of learning approach to teaching. The teachers felt this lack and I was invited first to work with Year 10, who had little art exposure, then with other classes. The staff was interested in using art to assist students in all age groups to better express their emotions. Apart from the benefits of expressing the usual range of emotions, this was a particular issue in Ahmedabad because two relatively recent events – riots and a significant earthquake (which killed many citizens) – had traumatised the city. The staff was also interested in artwork that would develop a healthy relationship between the student and their body, a crucial element in the education of young people living in a conservative environment. “My project with Year 10 was to lay some foundations to working with ideas around the self, the mask, the body and using these as expressive forms. Year 10 is a difficult age at the best of times! The usual issues of adolescence test concentration. The loquacious teenagers were very hard to draw into the creative space to learn the skills of making art! But I was determined to show the students that having focus and skills allows them to express themselves, as well as discovering creative talent can be nurtured and useful. 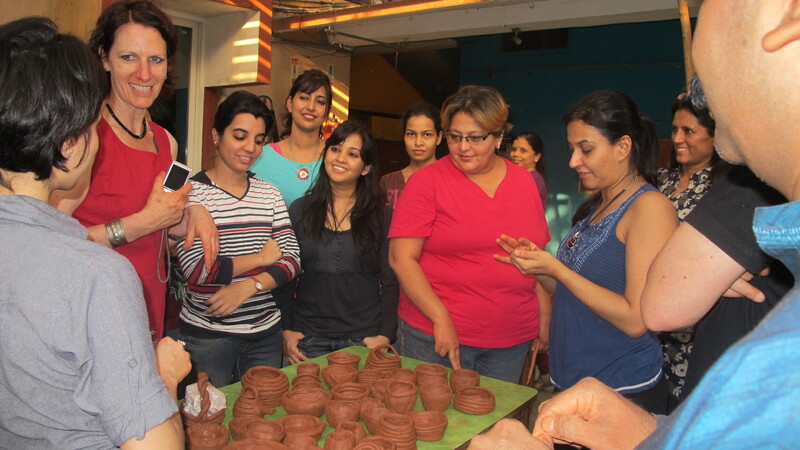 The school jumped at the opportunity to learn some skills in working with clay. The local art centre was put to full production to prepare a lot of clay – that means stamping with the feet, and kneading it into small balls. No machinery here! It was not long before the entire playground area was awash with terracotta clay and students sitting around making masks, pots and statues. Clay fever gripped the school! The teachers were very enthusiastic and keen to learn as well as teach so we also ran two days professional development workshops. Through our practical workshops in drama and claywork teachers learned skills as well as the pedagogy that informs the work we do. We will write about these programs in another blog.